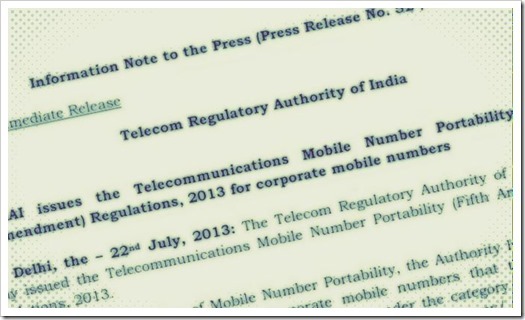 TRAI has issued amendments to MNP regulations for bulk porting of numbers in case of a corporate account. For individual mobile subscribers, the process of porting their number to another mobile operator is quite streamlined. However, TRAI received many complaints from corporate mobile users as operators were rejecting their requests for want of permission from their company to carry out porting. After looking at the complaints and the difficulties faced by these users, TRAI felt the need to have a separate porting process for numbers under corporate account. After consultation with stakeholders, TRAI has decided to make following provisions in MNP regulations for corporate mobile numbers. Upto 50 corporate numbers can be ported in a single porting request based on a letter of authorization from a corporate authorized signatory. Because the Corporate porting requests have multiple numbers to be processed, TRAI has raised the processing time limit to 48 hours. For individual requests, the time line stays at 24 hours. To carry out the changes into the system, TRAI has given 90 days to telecom operators to implement this change. It has been heartening to see TRAI aggressively pursuing interest of mobile consumers in India. Over last 12 to 18 months, they have come up many new amendments and regulations that favour mobile subscribers. Recently, TRAI also addressed the long standing problem for activation and deactivation of VAS. Many mobile consumers faced issue of Mobile value-added services getting activated without their consent and in turn their balance getting reduced due to unintended VAS subscriptions. The new regulations now call for explicit consent from a user along with an additional their party check!